Stone bathtubs are a unique alternative to a traditional porcelain tub. Free-standing stone bathtubs offer a unique design compared to traditional bathtubs and showers. The process of creating a stone bathtub is an intricate one. Our natural stone bathtubs are carved from a single solid block of natural stone, which means there are no seams in the final product. 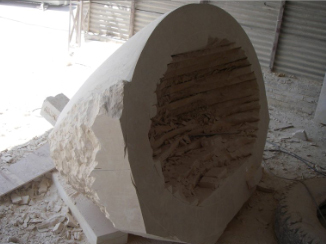 Our sculptors aim to preserve the inherent beauty of the swirls, veins and crystalline deposits in the stone. We believe adding seams into the design takes away from the natural beauty of the stone. Our sculptors begin the carving process by choosing a single block of stone to carve the tub from. Then they cut it down to a working dimensional size. 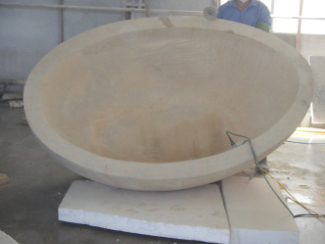 Once the stone is cut down to size, the sculptor begins to shape the outside of the bathtub and hollow out the center of the tub. 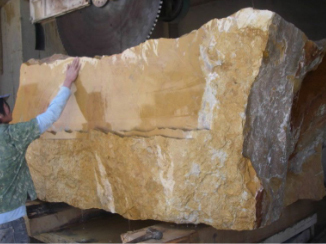 They make cuts with a stone saw and use chisels and other hand tools to break away the stone until the shape is defined. At this point, the shape of the tub is beginning to take form. The sculptor checks the wall thickness for consistency. To smooth out the tub, the sculptor uses orbital sanders and grinders. Now the stone bathtub is nearly finished. 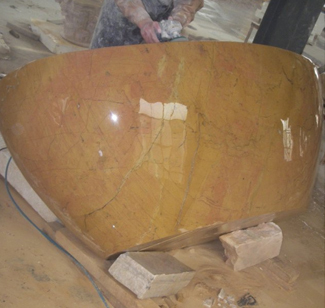 The last step is to polish the bathtub to bring out the true luster and color of the stone. Each stone bathtub is a one-of-a-kind design. If you are interested in adding a stone bathtub to your home, contact us.